We use technology to prevent crime happening: Instead of detecting crime after it has happened, you can stop criminals before they attack. Alarm activated CCTV provides protection of the whole site at all times, unlike security guards who can only be in one place at once, a CCTV system never needs breaks, it is never ill and is impervious to weather conditions, nor can it be threatened, bribed or injured. Tell the intruder to leave the site: The majority of our remotely monitored CCTV systems are installed complete with an audio warning facility, whereby our operatives can issue a live verbal challenge, before taking further action if needed. This feature has proven highly effective in deterring intruders before they cause damage. Remote Dial in by Phone or PC to view multiple sites: CCTV over the internet or “IP Link” is a very popular feature, this enables customers to view and control CCTV systems using any internet connected computer. For example, an owner could view multiple sites around the country, around the clock from the comfort of their own home or smartphone should they wish. Save €€€€’s on security costs: For companies using traditional manned security guards and mobile patrols, a switch to remotely monitored CCTV systems provides 24 hour protection with big benefits. Results show savings of more than 80% on the annual security bill, as well as boosting security standards. Servers continually poll the onsite equipment from the monitoring station, and any malfunctions are reported for remedy by the maintenance team. 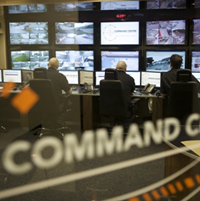 The monitoring control room is staffed 24 / 7 / 365 by experienced personnel, able to view and challenge intruders before damage or theft occur. If necessary, they have direct links to local Gardai who will give priority response for visually verified alarms. Hall Alarms only install equipment of the highest quality from the leading suppliers in the market such as Adpro, Heitel and Videofied. However, even top quality cameras or detectors, if poorly positioned, will flood a central station with false alarms making it impossible maintain a site’s security. Managing these issues is second nature to our experienced installation teams.